"Annals of Ovidius University Constanta-Series Physical Education and Sport/Science" edited by "Ovidius University Press" appeared in 1996. 2002, 2004, 2006,2007, 2008 academical year. The journal is Open Access and allows readers to read, download, copy, distribute, print, search, or link to the full texts of its articles and allows readers to use them for any other lawful purpose. 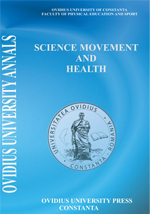 Ovidius University Annals, Series Physical Education and Sport/Science, movement and health by Ovidius University Press is licensed under a Creative Commons Attribution 4.0 International License. Based on a work at www.analefefs.ro. Permissions beyond the scope of this license may be available at www.analefefs.ro. ©2008 Ovidius University Constanta. All rights reserved.